View Animation simulating visitor's path growing over time. Journeys encourages interaction with the art, the physical space and each other. A sensor pin will be offered to the visitors upon entering the museum to enable participation in an interactive mural. 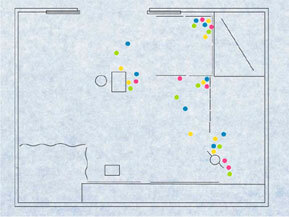 On the second floor, the visitor will find the mural and six pedestal kiosks with a line of dots to symbolize a path. The visitor's individual dots will rise above the others and as the visitor explores the museum, the path of the dots will continue to grow. At the end of the day, the visitor can choose to email a snapshot of their Journeys home.